This is my second forray into Tuesdays with Dorie, and I’m happy to report that I liked this recipe a lot better than the Irish soda bread I made a few weeks ago. 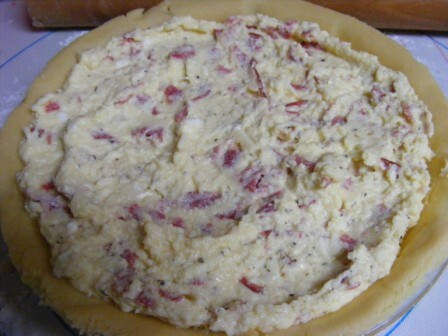 This recipe is from Nick Malgieri, and it reminded me of a savory version of his Neapolitan Easter pie. I should say up front that I’m sure there’s some historical reason for the name, but it really isn’t anything like a pizza. 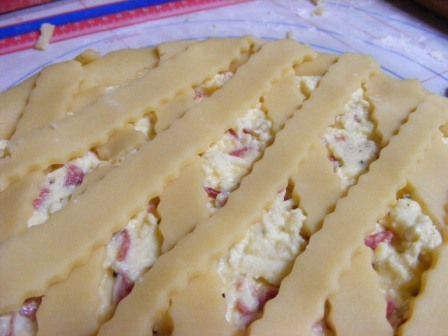 It’s more of a savory cheese pie, akin to a quiche, but not as custardy. 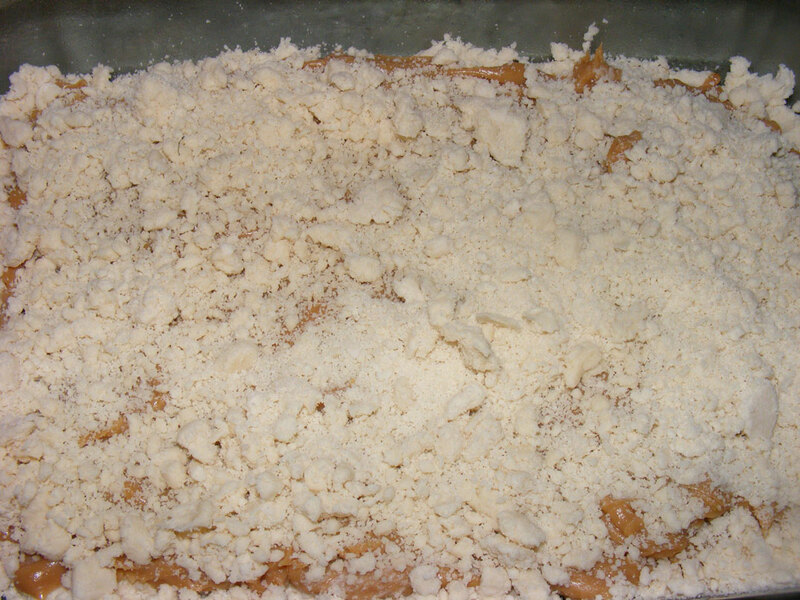 The crust is simple to whip up in the food processor. 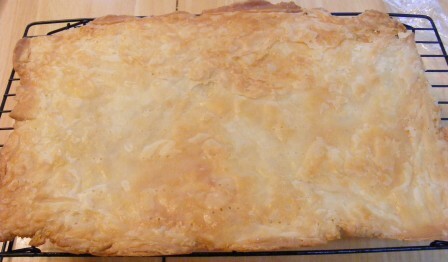 The surprise here is that, although this is a savory pie, the crust is quite sweet. I found my dough a bit on the dry side, so I wet my hands and kneaded a bit of water into the dough before rolling it out. It worked beautifully. The filling also came together quickly. It consisted of ricotta cheese, eggs, Pecorino Romano cheese, sweet Lebanon bologna (my substitution for prosciutto), mozzarella cheese, and spices. I began by stirring the ricotta to soften, then mixed in the remaining ingredients one at a time. 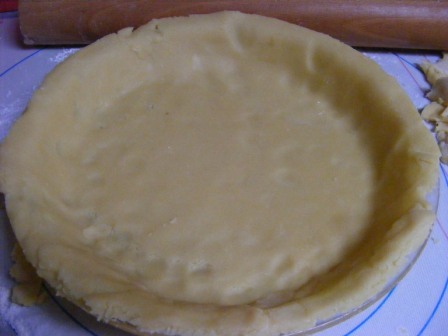 I spooned the filling into the crust and smoothed the top. I rolled out the remaining dough and cut it into strips with a ruffle-edge pastry wheel, then made a criss-cross lattice pattern on top of the pie. I baked the pie for about 40 minutes at 350°F, until the crust was golden brown and the filling set. 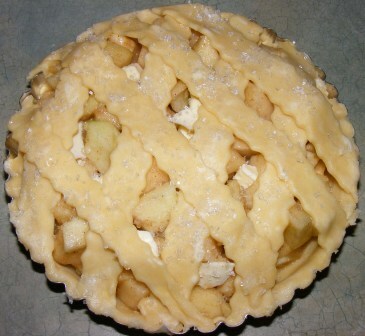 The recipe says to cool the pie completely before eating. I let mine cool for about 20 minutes, but we were hungry and decided to eat it while it was still warm. It seemed like it needed something light and refreshing to go with it. I wanted to make a frisee salad, but I didn’t have any greens in the fridge. I’m not sure what made me think of it, but I decided to toss together a quick carrot salad to eat with the pie. It turned out to be the perfect accompaniment. The pie was rich, sweet, savory, and salty all at the same time. I’m not sure how it would be with prosciutto, but the sweetness of the crust paired beautifully with the salty-sweet of the Lebanon bologna. And the carrot salad provided just the right coolness and acid to balance out the dish. We all agreed that this is a dish we would gladly eat again. This post is part of Tuesdays with Dorie. Check out the group website to see what everyone else thought of this dish. Our hosts for this recipe were Emily and Raelynn. 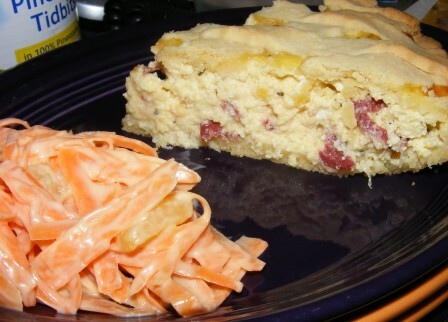 Surf on over to their blogs for the pizza rustica recipe. Today, we bring you a Modern Baker Challenge two-fer. One thing that I love about baking cookies, brownies, and bars is that it’s almost as easy to make two recipes as it is to just make one. In fact, growing up I don’t ever recall my Mom making just one type of cookie when she baked. And she still makes them in multiples to this day, as evidenced by the fact that she often shows up here with bags of Snickerdoodles, chocolate chips, and peanut butter cookies. So it was not at all unusual for me to decide to bake Sour Cream Brownies and Caramel Crumb Bars from the Cookies, Bars & Biscotti section of The Modern Baker on the same day. 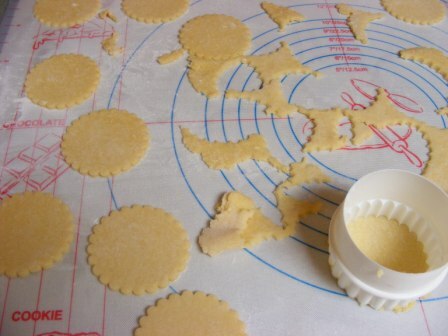 In fact, I’ve baked a number of the cookie recipes in this section this way, even though I’ve blogged them separately. But there was just something about the way these two looked on a plate together that made me decide they wanted to be in the same post. I started with the Sour Cream Brownies. Like the Cocoa Nib Brownies, these babies are loaded with bittersweet chocolate. 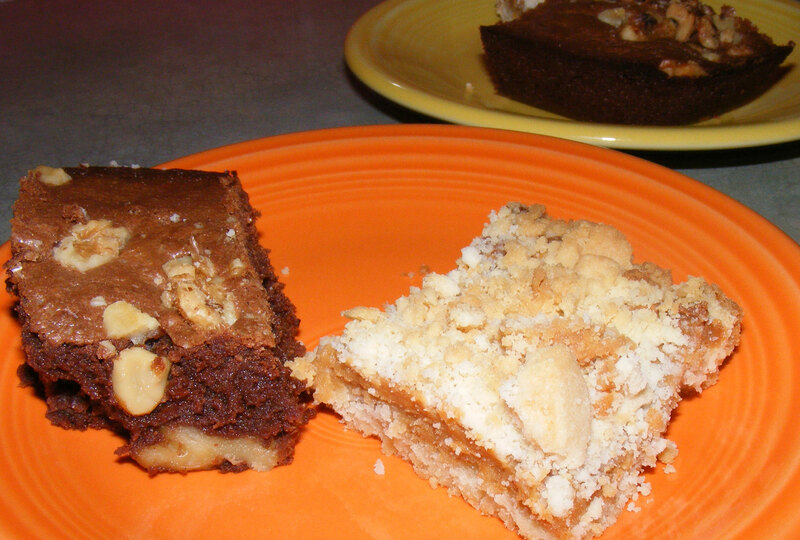 Nick Malgieri says that the inclusion of the sour cream cuts back the sweetness just a bit and keeps the brownies moist, and I’d have to agree. 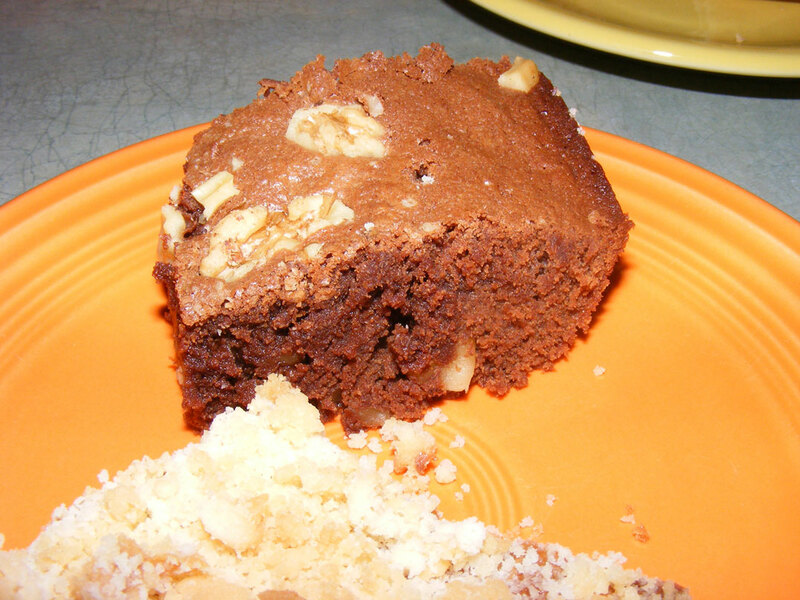 These brownies are very rich, but not cloying; and they are moist and fudgy, even after a day or so in the fridge. If you’ve ever struggled with melting chocolate over a pan of simmering water while holding a bowl and trying not burn your fingers, or attempted to melt it in the microwave without burning it, you’ll appreciate Nick’s technique for melting the chocolate in this recipe. I melted the 6 ounces of butter called for in the recipe in a saucepan and let it bubble for a few seconds. Then I removed the pan from the heat, dropped in the chocolate chunks, and shook the pan to submerge the chocolate in the hot butter. By the time I had mixed the brown sugar, eggs, sour cream, salt, and vanilla in the mixer, the chocolate was melted and ready to be whisked into the butter. I stirred the chocolate mixture, and then the flour and walnuts, into the mixing bowl with a rubber spatula — another trick I learned from Nick. Overmixing the batter results in tough brownies and fallen cookies, so he recommends mixing in the last few ingredients, including the flour, by hand. 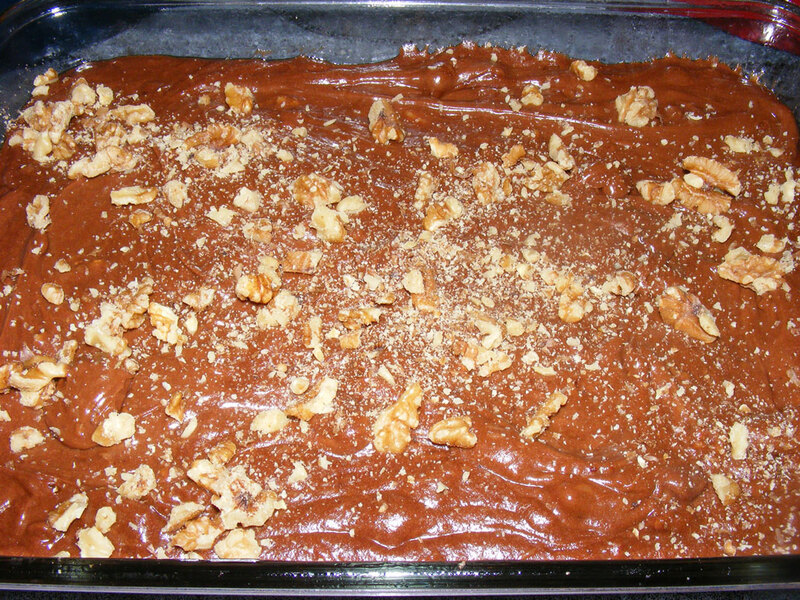 I spread the batter in the pan, smoothed the top, and sprinkled it with a few more walnuts. I baked the brownies at 350°F for 30 minutes, and not a second more. They still looked very moist in the center, but that’s exactly how the recipe said they should look. I set the brownies aside to cool. Cutting them would have to wait a day, as Nick also recommends refrigerating brownies overnight. 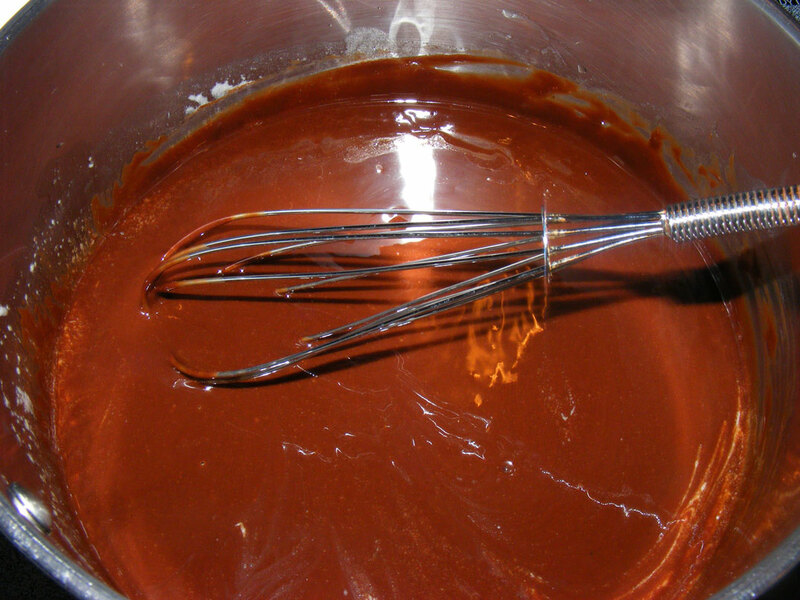 This makes moist brownies like these easier to cut and intensifies the chocolate flavor. 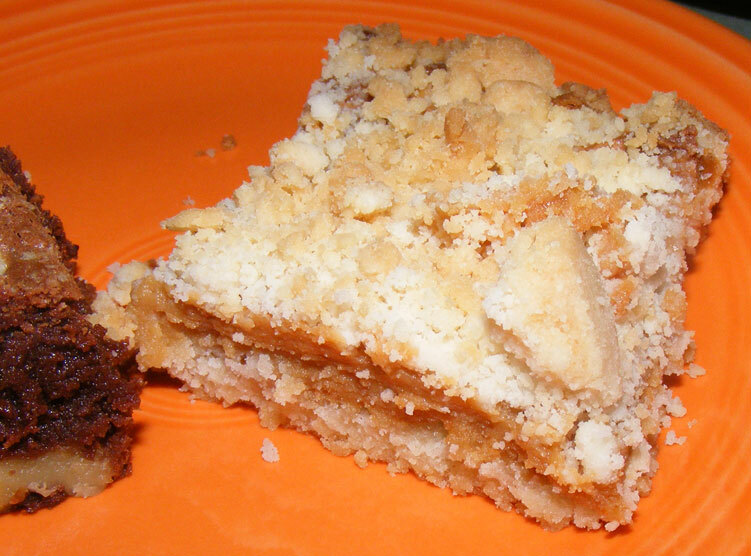 While the brownies were baking, I mixed up the Caramel Crumb Bars. These bars are Nick’s favorite cookie, and I can see why. 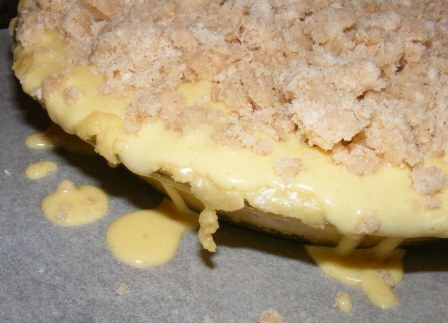 They consist of three layers — a buttery dough, caramel filling, and crumb topping. And yet they are surprisingly easy to make. 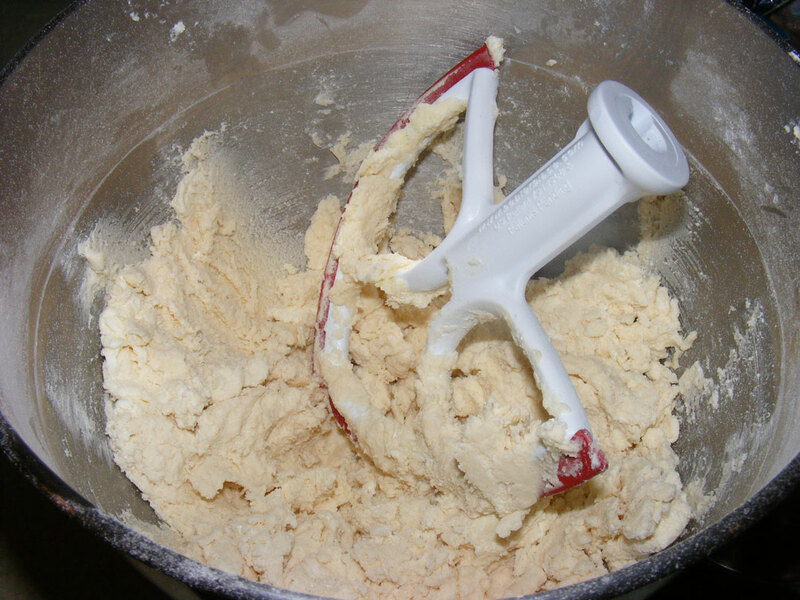 I began by mixing the dough in the mixer. 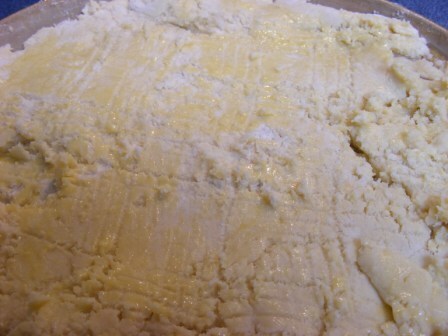 It was made of butter, sugar, salt, vanilla extract, and flour, all mixed together to a soft, silky texture reminiscent of Scottish shortbread dough. I pressed 3/4 of the dough into the pan for the bottom crust. 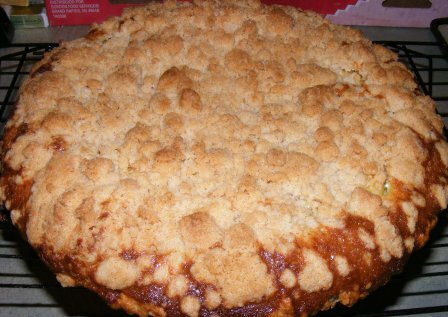 I put the pan in the refrigerator to chill and added a bit more flour to the remaining dough to make the crumb topping. The next step was to make the caramel. Despite my previous issues with making caramel for semolina cake and pineapple tatin, I have since had better success with caramel, so I felt pretty good about making the filling for these bars. 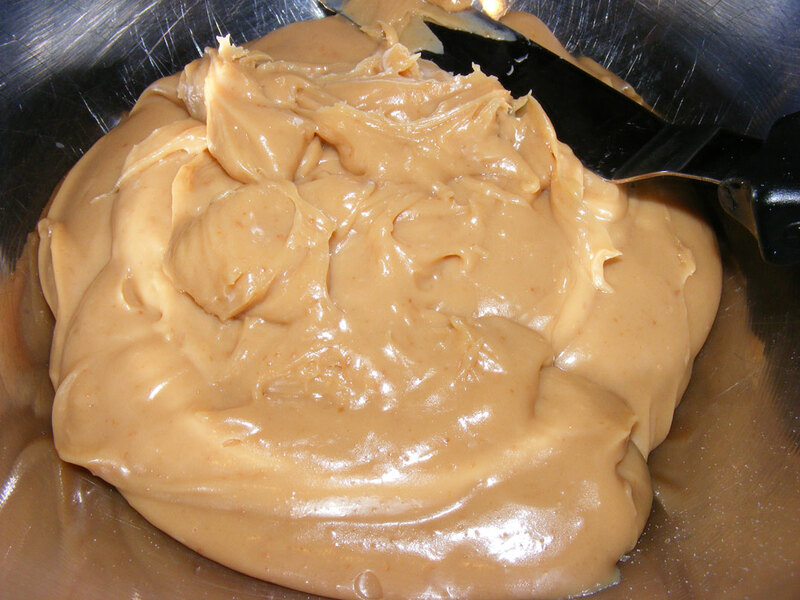 Besides, this caramel started with sweetened, condensed milk and light corn syrup, so I was halfway home before I ever began. I put the milk and corn syrup into a pan with butter and dark brown sugar. 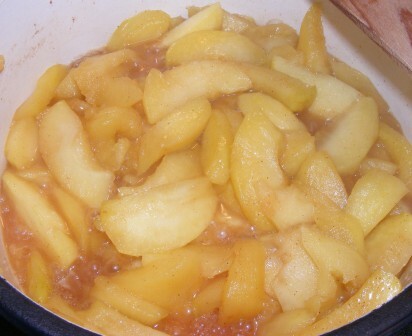 I brought it to a low boil, then let it simmer for about 10 minutes, until the caramel was thick and had taken on just a little bit of color. I set the caramel aside to cool for a few minutes before assembling the bars. 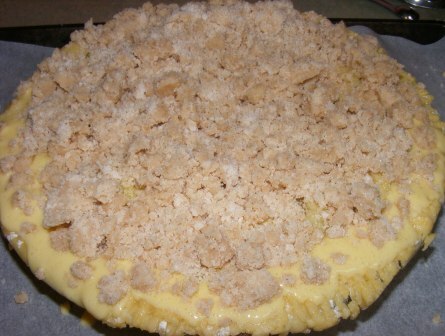 I spread the caramel over the chilled dough, then sprinkled the crumbs on top. 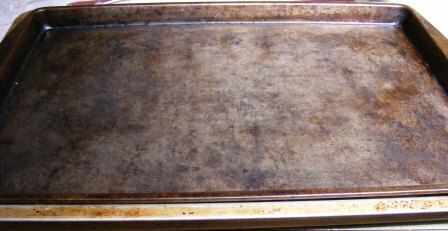 By this time the brownies were finished baking, so I put the caramel bars into the oven, which was still set at 350°F. 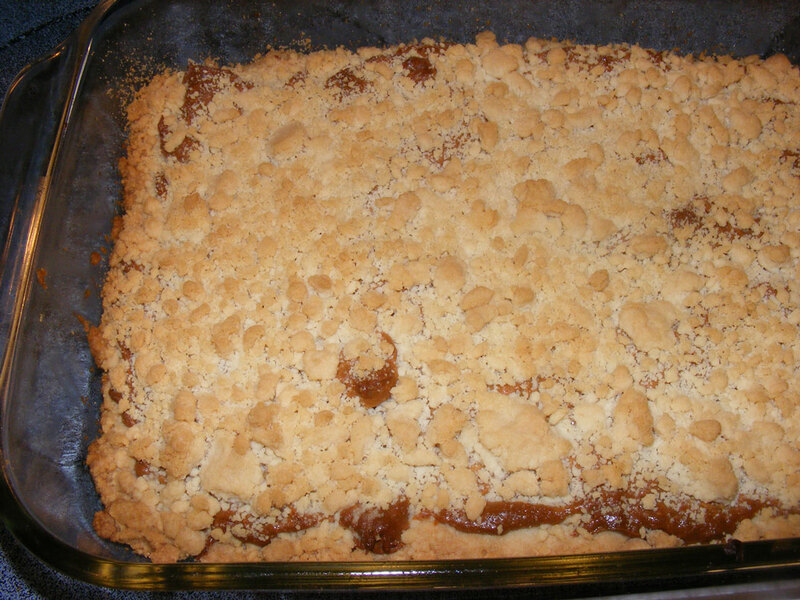 I baked the bars for 30 minutes, until the filling was a deep, caramel color and the topping had baked through. I cooled the bars in the pan for about 20 minutes, then cut them. Because of the thick, gooey caramel, these bars are easier to cut when still slightly warm. And although the recipe says to cool them to room temperature before serving, I can attest that they are delicious when they are still a bit warm. I can easily see why the caramel crumb bars are Nick’s favorites. The sweet, creamy caramel filling is out of this world, and it pairs nicely with the soft, buttery, slightly chewy crust. 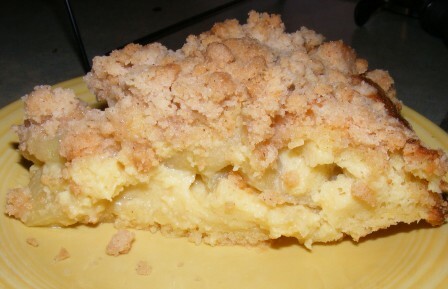 And of course, crumb topping goes well with almost any sweet. These are definitely on the repeat list. In fact, just writing this post has me thinking about making them to take to work tomorrow. The brownies came out of the fridge moist and chewy. They were rich, dense, and oh-so-chocolatey. 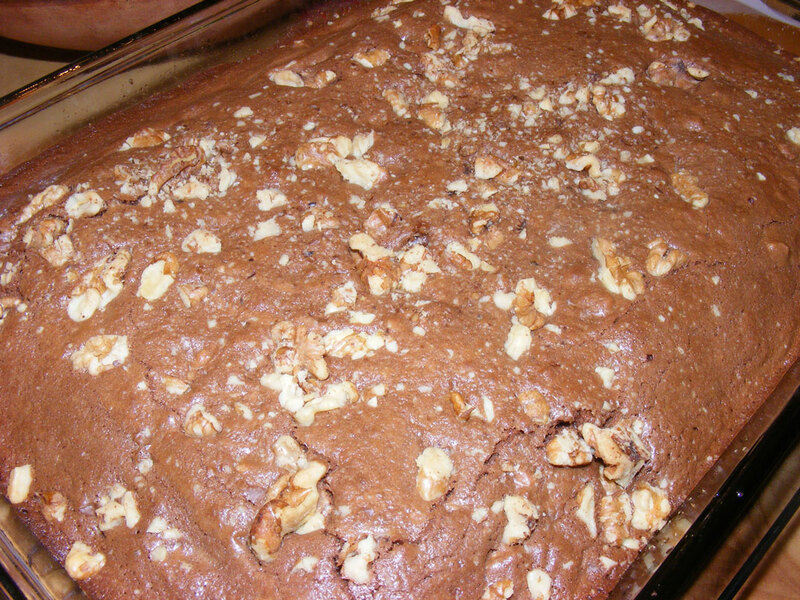 And of course, walnuts are a classic addition to brownies and gave these a nice crunch. Having made a number of Nick’s brownie recipes, I am convinced that using real chocolate, rather than cocoa or chocolate chips, is the way to go for rich, moist brownies. The only thing I’m not sure of is whether I liked these brownies or the cocoa nibs ones better. I’ll probably have to make both of them together so I can do a side-by-side comparison. In the interest of baking science, of course. First published in 2008, Nick Malgieri‘s cookbook, The Modern Baker: Time-saving Techniques for Breads, Tarts, Pies, Cakes, and Cookies, has just been reissued in paperback. Like most home cooks, I own a lot of cookbooks. Some I turn to all the time; others I rarely touch. The Modern Baker never leaves my kitchen. I have really come to appreciate the clarity with which the recipes are written, how easy they are to follow, and the consistent results I get when making them. But what really sets this book apart from other cookbooks is the way Nick takes the mystery and intimidation out of baking. 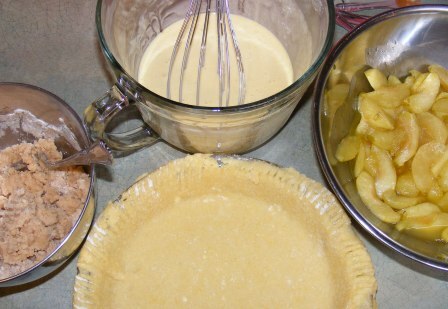 Through his helpful, step-by-step instructions and photos, he shows how to make perfect pie crusts, “instant” puff pastry, bakery-quality cakes and pies, and company-worth tarts. I originally picked up The Modern Baker in hopes that I could finally overcome my mental block when it comes to pie crusts. 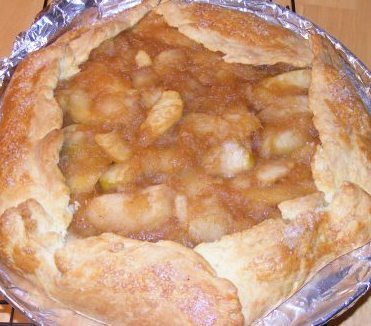 As comfortable as I am in the kitchen, both with cooking and baking, I had never been able to make a decent pastry crust. It wasn’t that I didn’t try; I just could never seem to get it right. My dough would be gooey or too dry, and when I baked it, it would turn out tough or dry and crumbly. So I was delighted when I made Nick’s quick pastry crust and it turned out perfect the first time. And the second. And the third. And every time since. The puff pastry is another breakthrough in this book. 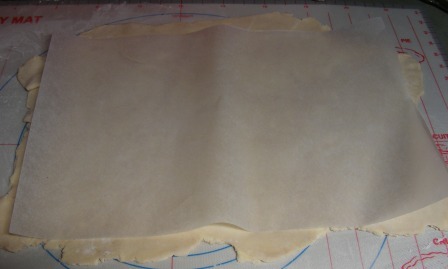 It mixes up in minutes and doesn’t require rolling in butter in “turns” as in most puff pastry recipes. After mixing the ingredients in the food processor, you pat it out, fold it over itself envelope style, roll it up, and pop it in the fridge. And the resulting puff pastry surpasses anything you can buy. Since I discovered Nick’s technique, I always have homemade puff pastry in the freezer. And the book has taught me countless ways to use it. If you fancy yourself a cook, but have always been intimidated by baking, you need to own this book. And if you are a seasoned baker and want to find some new, streamlined techniques for the recipes you love to make, you’ll find them here. Even if you’ve never tried your hand at homemade bread or layer cakes, you will feel like a real baker after trying just a few recipes. In fact, whatever your level of baking experience, you will learn amazing tips, techniques, and tricks from Nick Malgieri and The Modern Baker. 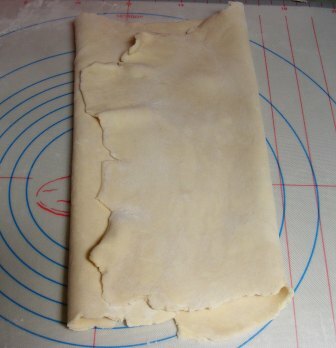 The second recipe in the Puff Pastry section of The Modern Baker is, like the instant puff pastry, used as a base for many of the recipes that follow. I was a little nervous the first time I made the pastry layer, as I knew another recipe would rise or fall based on how well I did making the base. The recipe isn’t particularly difficult, although the technique was new to me. 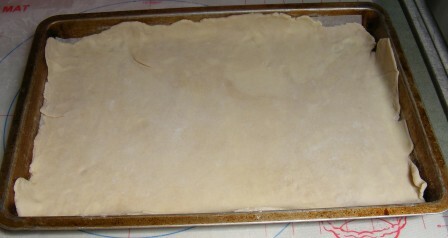 I began by flouring a pastry mat and rolling out a quarter batch of puff pastry dough. The dough was very firm when I got it out of the fridge. 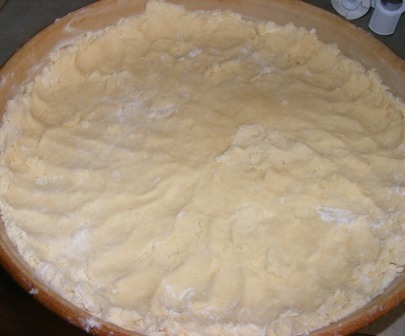 I pressed it with the rolling pin using short strokes rather than rolling from end to end. 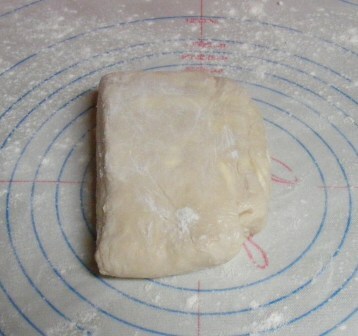 This flattened the dough and began to soften it. 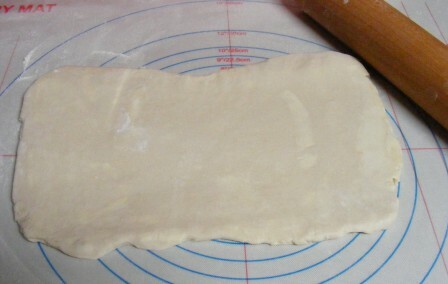 Once the dough had softened up a bit, I rolled it (without going over the ends), turned it 90°, rolled again, and continued turning and rolling until I had a thin rectangle of dough. 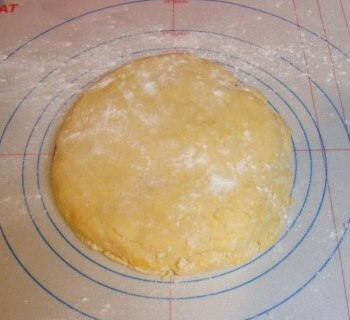 A few more turns and rolls, and the dough was the size of my 10 x 15-inch pan. 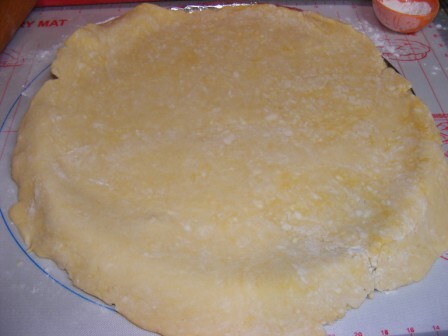 I checked the size by laying a piece of parchment cut to the size of the pan on top of the dough. 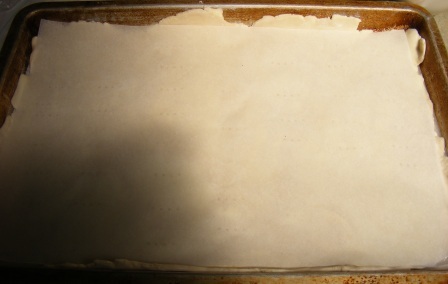 To transfer the dough to the pan, I folded it in thirds, then lifted it to the parchment-covered jellyroll sheet. I fit the dough in the pan, then covered it loosely with plastic wrap and put it in the fridge for a few hours before baking it. When I was ready to bake the dough, I preheated the oven to 350°F. Once the oven was heated, I took the dough out of the refrigerator, uncovered it, and pricked the surface of the dough with a fork. 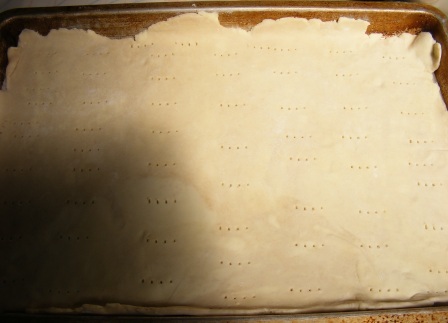 …then topped it with another jellyroll pan. I baked the pastry layer for 20 minutes, then grabbed both pans and flipped them over and baked the dough for another 15 minutes on the other side. 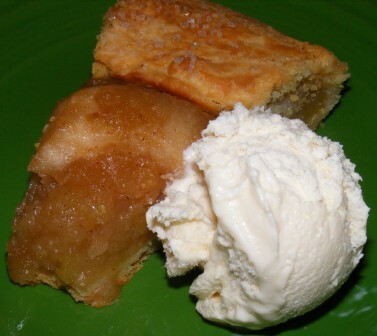 (The recipe called for baking the pastry for 15 minutes, then flipping the pan and baking an additional 10 minutes. Even though my oven heats correctly, it took an additional five minutes on each side. I suspect this is because my pans are double insulated airflow pans.) 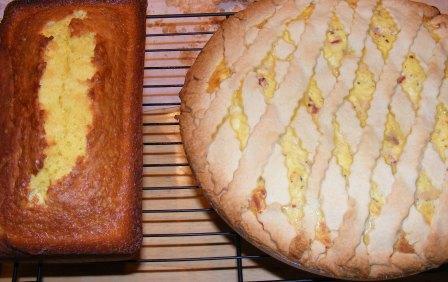 I took the pans out of the oven, lifted the top one off, then checked the pastry for doneness. It was crispy and nicely browned. 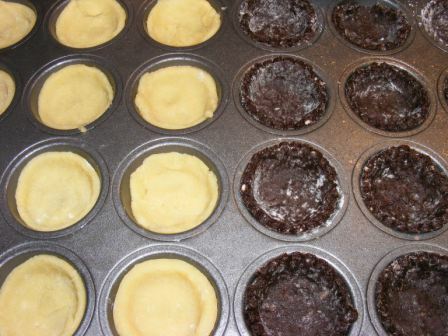 I replaced the top pan and cooled the pastry layer between the pans to keep it from curling as it cooled. Then I removed it from the pans and let it rest on cooling rack until I was ready to use it. One of the classic uses of a baked puff pastry layer is for a dessert called “mille-feuille”, which translates to “thousand leaves”, referring to the layers that well-made puff pastry exhibits. Nick’s instant puff pastry dough, prepared this way, is perfect for mille-feuille, Napoleons, and any other recipe requiring a thin, shatteringly crisp pastry layer. 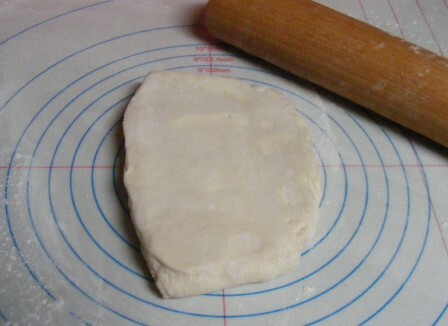 But a word of warning: most recipes require you to cut the pasty layer to the size or shape needed for that particular application. The layer cuts beautifully, but it may take some resolve on your part not to shove all the scrap pieces in your mouth. More resolve than I have. 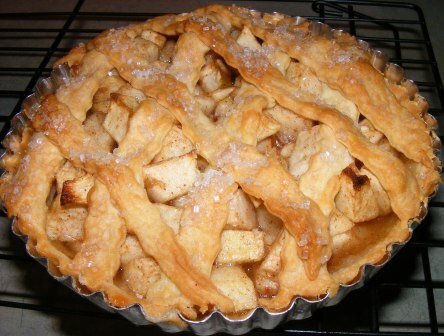 This is the second of three apple pie recipes in the Sweet Tarts & Pies section of The Modern Baker. 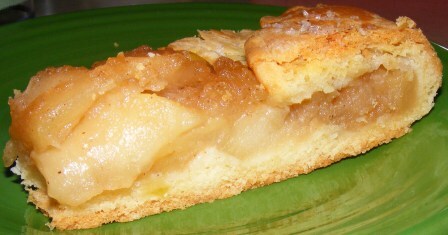 The first one, Breton apple pie, is based on a French cake recipe and actually reminded me more of cake than pie. 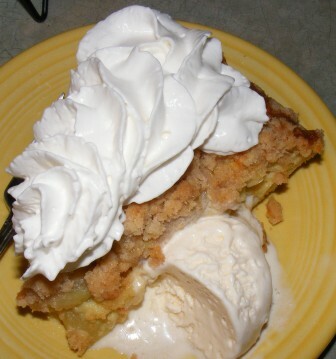 The third recipe, sour cream apple pie, is a classic crumb-topped apple pie, albeit with a sour cream twist. 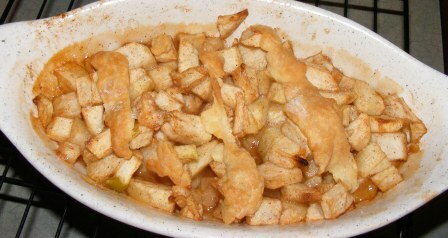 This recipe to me is less like a pie than an apple tart. 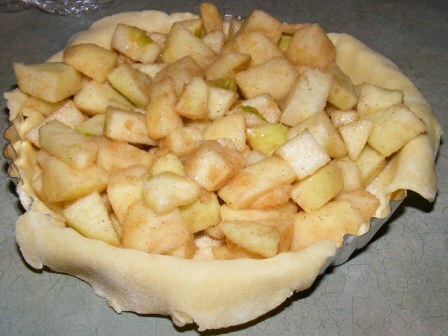 In fact, it is very similar to the rustic apple tart I made last Fall using a mix from Fowler’s Mill. 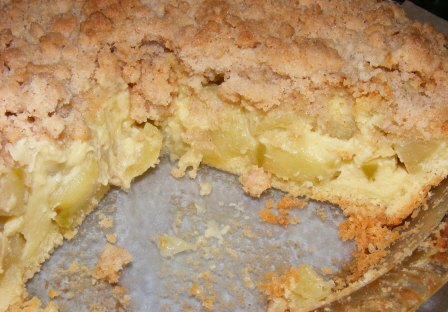 As large and impressive as this tart is, it’s really simple to assemble. 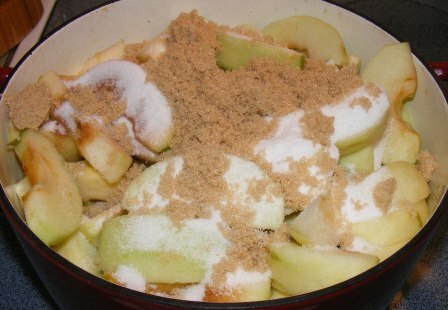 Other than the sweet dough, there are only five ingredients: apples, butter, granulated sugar, brown sugar, and cinnamon. 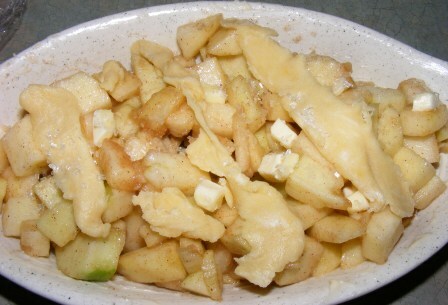 I began by cooking the apples — a mixture of Granny Smith and golden delicious — in butter with the sugars and cinnamon. 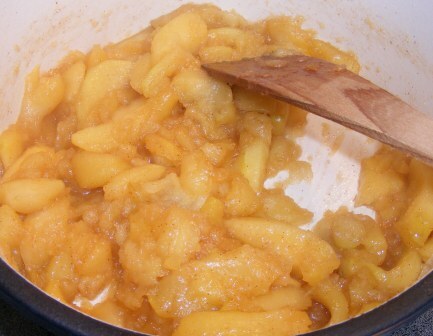 As the mixture cooked, the softer golden delicious apples began to break down, while the firmer Granny Smith ones held together. 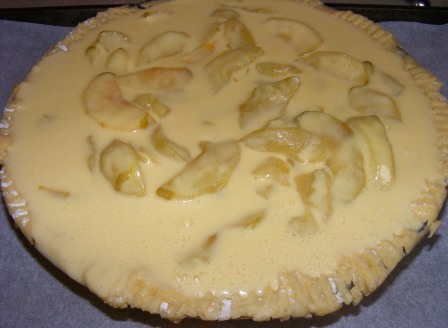 This would provide contrasts of both texture and flavor to the tart. 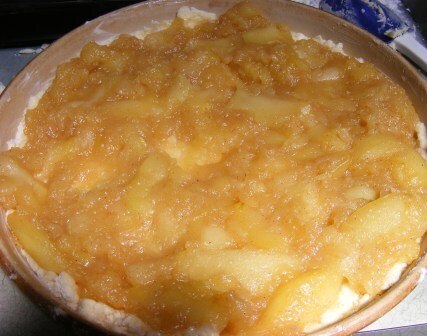 While the apple mixture cooked, I rolled out the dough. 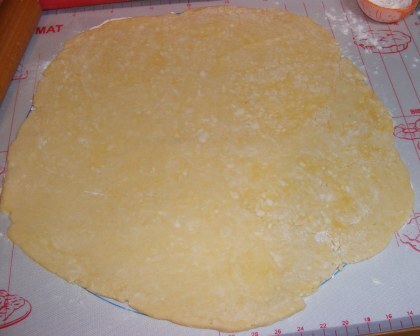 The recipe calls for a double recipe of sweet tart dough, rolled out to a 16-inch circle, which is then draped over a large pizza pan. 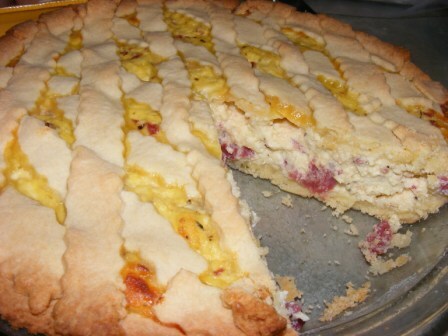 I brushed the edges of the tart with egg wash, and sprinkled with finishing sugar. 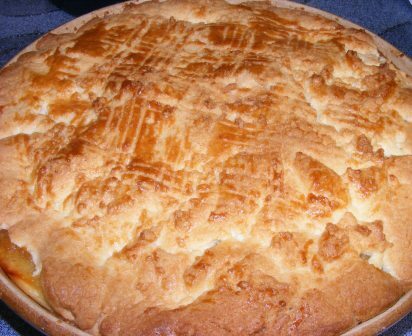 I baked the tart at 375°F for about 40 minutes, until the crust was golden and the filling bubbly. I let the tart cool, then cut and served it for dessert. 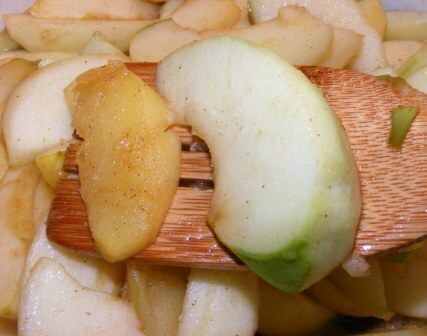 It was sweet, spicy, flavorful, and the mix of apples gave it a subtle complexity. The tart was delicious on its own. But of course, a little ice cream wasn’t amiss, either. I thought about cutting this recipe in half, as I knew it would be absolutely huge. In the end, I’m glad I didn’t, since part of what made this tart so impressive was its sheer size. And regardless of how big it was, none of it went to waste. With two weeks left to go in the Sweet Tarts & Pies section of the Modern Baker Challenge, I found myself with four recipes remaining. The kids are out of town, and we decided to have a low-key day today, so it seemed like the perfect opportunity to play a little catch-up. I decided to knock out three recipes at once. The lemon lime tartlet and chocolate caramel pecan tartlet recipes each make 24 tartlets, way too many to have around with just J and me to eat them. Since each recipe calls for the tart shells to be prebaked, I figured I would bake the shells together and then fill them. 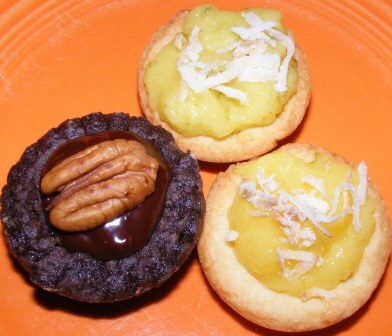 As for the third recipe, well, that’s the tartlet shells for the chocolate caramel pecan tartlets. The recipe calls for shells made with chocolate nut dough, and since this is the first recipe to use that dough, I hadn’t made it yet. The lemon lime tartlets are made with sweet tart dough, which I’ve made for many of the recipes in this section. I mixed up both doughs early in the day and let them chill in the fridge for a few hours. For the lemon lime tartlets, I rolled out the sweet tart dough, cut it into circles, and pressed each disk into a mini muffin pan. Then I did the same with the chocolate nut dough. I chilled the dough in the pans for about an hour, then baked the shells in a 350°F oven for 12 minutes. 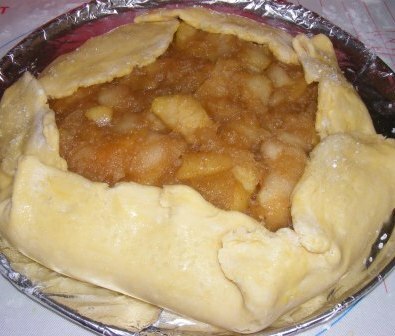 Although I pricked the dough well with a fork before baking, the shells puffed up to the point where there was no room for filling. 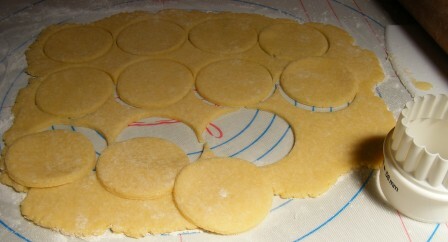 While the shells were still hot, I pressed the center of each one with a small ladle to make room for the filling. I cooled the crusts in the pan for a few minutes, then removed them to a cooling rack. 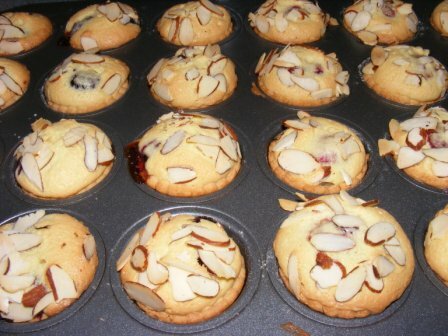 A few of the bakers in the Challenge noted that their tartlet shells stuck when they baked them in mini muffin pans. Knowing this, I had sprayed my pan lightly with spray oil, and my shells came out beautifully. 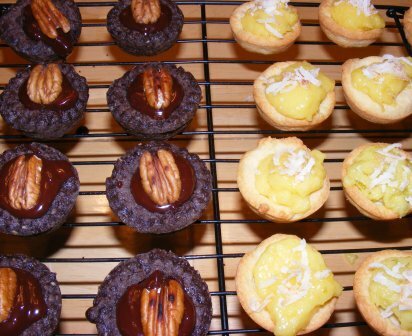 While the tart shells were cooling, I toasted coconut for the lemon lime tartlets, then made the filling for the chocolate caramel pecan tartlets. (I didn’t have to make the lemon lime filling, as I had leftover lemon and lime curds in the fridge from making ice cream.) The chocolate filling isn’t particularly difficult, although it does require quite a few steps and dirties a lot of pans and bowls. 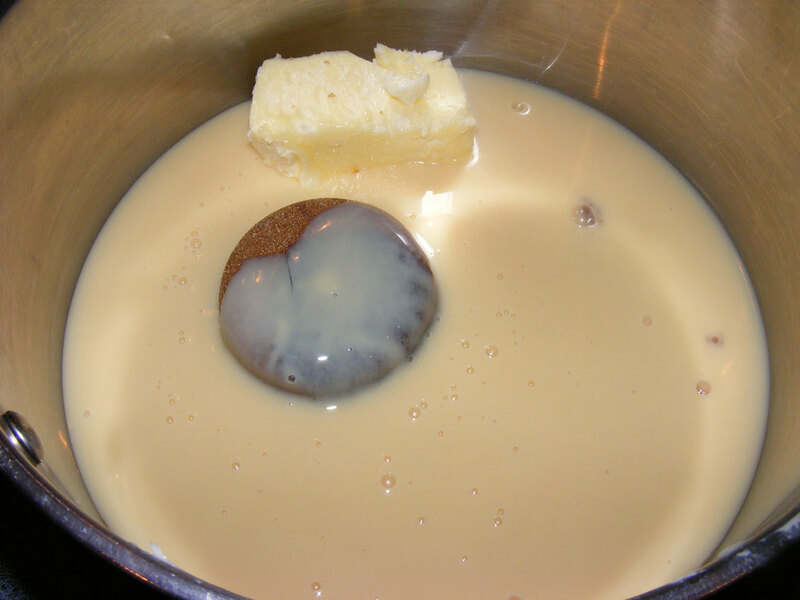 The caramel is made in one pan while the cream is heated in another. These are combined, then scraped into a bowl to cool. 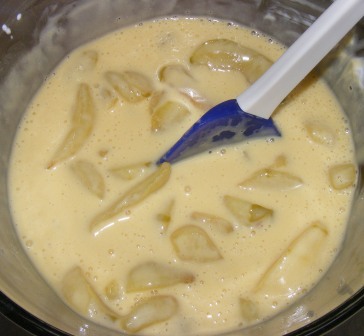 Chocolate, which has been melted and cooled in another bowl, is then added to the caramel-cream mixture, and butter and nuts (which have been toasted in a separate pan) are added last. 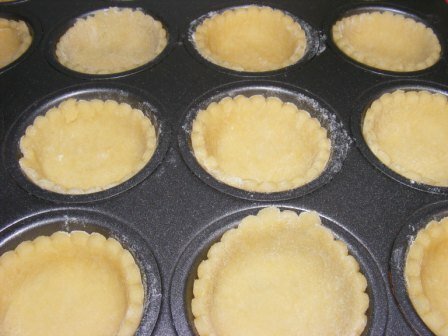 After making the filling and shells, assembling the tartlets was a breeze. I spooned the chocolate caramel pecan tartlet filling into the shells and topped each one with a toasted pecan. For the lemon lime tartlets, I had planned to mix my lemon and lime curds, which I had made and stored separately, but Nick cautions against overstirring the curd, lest it become too liquid. I tested this by putting a spoonful of each into a bowl and mixing them. 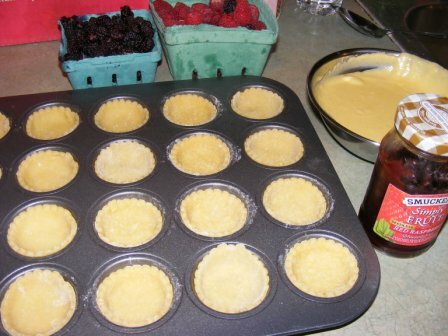 Sure enough, the curd broke down and become too watery to hold up in the tart shells. 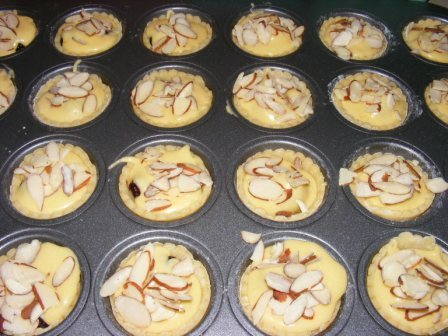 So I filled half the shells with lemon curd and the other half with lime curd, then topped them with toasted coconut. 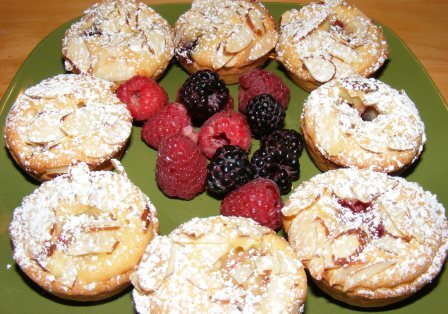 My wife and I enjoyed these tartlets for a late-evening snack. We loved the flavor of all three of the tartlets, although we did discover that it was best to eat the chocolate ones first, as they tended to taste a little bitter after eating the curd-filled tartlets. 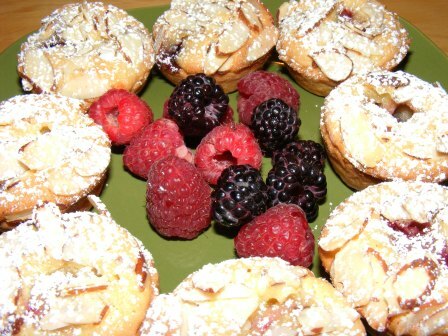 These were delicious tarts, and I will definitely make them again. 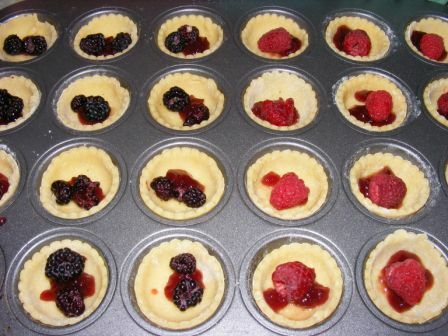 However, unless I’m making them for a finger-food event, I would be inclined to do them as full size tarts, rather than tartlets.